What to know: Vivid colors, music and dancing, make this appealing. "I like the animals and colors." Kids want to watch it over again. They like to sing along and they all danced. "It was awesome." "My friends will like it because it is nice." It is hard to even get the kids to talk about the DVD, they just want to keep on singing. Vivid colors, music and dancing, make this appealing. Characters are bright and bouncy and songs have a good beat that make you want to dance. A new spin on some familiar songs makes kids take the time to listen to the lyrics. A great tool for breaking the ice on a play date. Your child will jump off the couch and start dancing and laughing, and you might just join in. Thirteen animated music videos that take your little ones on more whimsical adventures in this highly anticipated sequel. 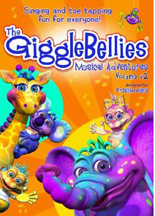 Featuring a blend of popular traditional children's songs that have that GiggleBelly twist, and fun original GiggleBellie tunes.